The outfit is very good quality. I loved the fitting as well. The issues that I forsee was the delivery phase of the process. I would suggest they put correct dates especially for products which are suppose to be ready to ship. Very nice sarees ,lehangas n Indowestern dresses. I like the product from Weddingsurat. Thanks weddingsurat for making my day!!??????? ?All the items ordered are so well fitted and neatly finished. .wow they are so perfect!! I will be buying more products. I am so glade to find your website. Service was really quick and efficient. I received it within two weeks. I would have received it even faster if it wasn't for problems at customs. The suit fits perfectly although the colour is different to the one shown on the picture - still beautiful though. I am extremely happy with the quality and also the size fits good, except the cup size. That is the one reason i always hesitate to order saree blouse with built in bra.I hope you guys come up with something better regarding the bra cup. Thanks Jyothi! It's so beautiful and the delivery time was quick but efficient! Very happy with my saree! Very good customer service. Great buy. Very happy with the salwar suit I recieved and it was great shopping with u guys!! Great customer service n recieved my suit for the diwali?? Very elegant collection and great customer service,I'm really happy to do online shopping with this site. I really appreciate the service. The product I wanted was not available till 11 may but the team made specia efforts n delivered it by 29 april, two days earlier than they promised. Thanks alot. I am really very happy with my order. Thank you so much Wedding Surat. 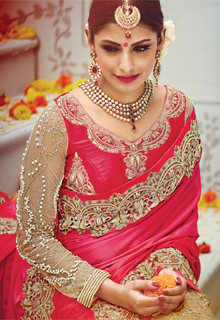 Wedding Surat is a great online shopping site as far as my experience goes. Love it. Thank you Wedding Surat. I really liked my ordered outfit. Thank you Wedding Surat. Thank you for my ordered outfit. It is in good condition. I liked your customer service. Keep it up and best wishes. Everything was fine regarding my order. Fast delivery and satisfactory item. Keep up the good job. I really loved my ordered outfit. It was great shopping with you. Your website is very easy to use with the filters for so many specifications. Its been a lovely experience. Lovely staff and very prompt help was provided. I really liked the stitching and design. I would definitely order next time. I received my order today and I cant believe how fast the delivery was. Wedding Surat is the best. Keep up the excellent service. My outfits are gorgeous. Thank you Sayan for the detailed email that helped me so much. Thanks for having a good customer service. I found all my ordered outfits with good finish and well packed, in short, up to my expectations. I truly appreciate your customer services. Working in Australia, we have very high expectations from service provider. I am pleased and proud to say that you all can match the service standards of Australia. Proud to be an Indian. Continue your good work. My ordered item is really good. Overall your customer service is super. My shopping experience with Wedding Surat was very, very good. Thank you. Everything regarding my order went smoothly. I could not believe how fast I received my ordered outfit. Thank you! I have received my outfit and it is really awesome. Thank you. I ordered an outfit for the first time and I was pleasantly surprised that it exceeded my expectations. In fact, the actual outfit looked even better when I received it than in the photo.